My head jerked around in his direction. “Really? 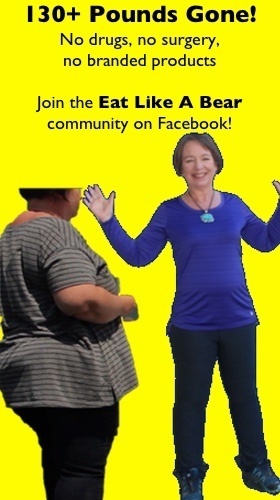 How did you know feverfew is good for headaches?” He couldn’t remember. In my quest to get this emerging teenager outside with me and engaged in projects, I suddenly found a new angle: homemade pain relief. Up to this point, I have been limited to harvesting leaves and buds to create new desserts like our pine needle cookies (here) or bay leaf flan (here). In this project we put the cart before the horse in extracting the properties of these local plants into a solution of alcohol and water. The alcohol- and water-soluble portions of the plant will populate the liquid in our project, creating a liquid headache remedy. Each of these herbs has a long tradition of use as a headache remedy. If you have only one or two at your disposal, adapt the recipe and use those. Each in isolation is likely to bring some relief. I have added them all here for two reasons: (1) Each plant offers its own unique profile and using all three increases our chances of getting some relief. (2) The lemon balm and peppermint help balance the bitter flavor of fever few. Fever few has the most basis in research, particularly in preventing migraine headaches and reducing their severity (see the citations below), but it has also been used traditionally to reduce symptoms at onset. 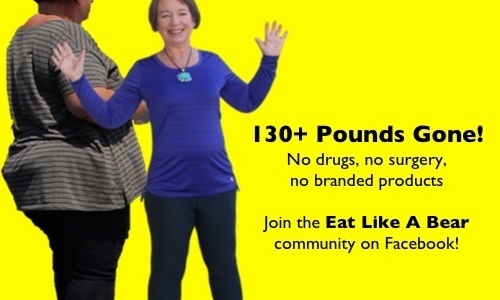 As for flavor, you certainly would not reach for it for a flavor experience. The mints we add may not only provide you with some headache relief, but they will also make the tincture a bit more palatable. As for why these herbs may bring headache relief, these herbs are known for their analgesic, anti-inflammatory, and nervine properties. These properties help relax and calm your mind. The herbs may not bring complete relief but may be a good tool for you to get through your headache a little easier. I include a recipe here for fresh herbs and dried herbs, following the lead of herbalist Henriette Kress in Practical Herbs. She advises using a high-proof alcohol with fresh herbs and a lower-proof alcohol with dried herbs. Basically, you want to ensure a sufficient water quantity in your tincture so that the water soluble components of the herbs make it into your tincture along with the alcohol-soluble components. Dried herbs contain no water and you basically make up for that issue by using a lower-proof alcohol that essentially brings a bit of extra water to the tincture. Measure your herbs. For fresh herbs, mince well to increase the surface area. Place herbs in glass jar. 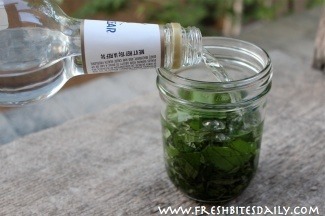 Pour alcohol over the herbs, completely covering the herbs and adding about 2 inches of alcohol above the level of the herbs. Cover the jar with a lid, securing well, and give it a good shake. Keep the jar in a dark, cool storage area that also allows you easy access. Shake the jar daily for a few weeks. Strain the herbs from the liquid — give the herbs a bit of a squeeze to get all of your tincture out. Strain the liquid through cheesecloth. Bottle in a dark glass bottle and store in a cool, dark place. Your tincture should stay useful for several years if you store it properly. 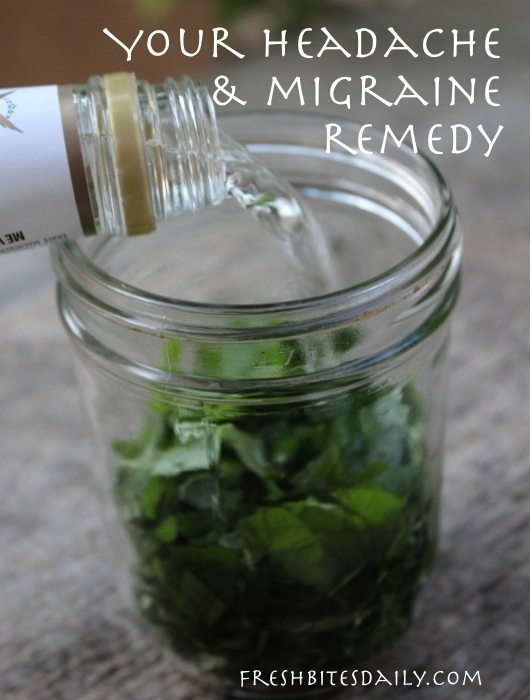 This herbal tincture is a great remedy for headaches and some migraine headaches as well. Combine dry herbs in a clean mason jar. Cover herbs in high-proof grain alcohol. Secure jar with lid and shake. Store in a cool, dark pantry for at least two weeks, shaking occasionally. Strain out and retain liquid, discarding the herbal solids. When you feel the onset of a headache, take 1/4 of a teaspoon. Take an additional 1/4 teaspoon every 20-30 minutes. There is no literature on how much to take but if you don’t get relief from a teaspoon, then your type of headache may not respond well to the constituents of these herbs and you may want to try a different remedy. In the meantime, a teaspoon of herbal moonshine is not going to make you drunk. When I say, “you,” I assume you are an adult since we are talking about alcohol, even if it is a tiny bit of alcohol. As for the safety of these herbs, James A. Duke in The Handbook of Medicinal Herbs reports no known side effects of lemon balm. As for peppermint, Duke warns that it is “Not to be used in patients with achlorhydria, biliary or gallbladder obstruction, or gallstones. Concentrated oil may induce dermatosis, flushing and headache, if rubbed on profusely or inhaled. 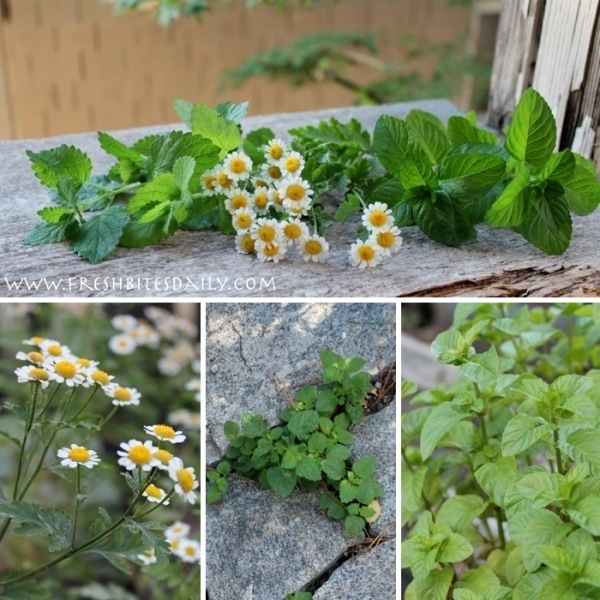 Leaf contains much astringent tannin that can damage the liver and intestine with prolonged use.” As for feverfew, Duke reports: “Oral feverfew may cause mouth ulcers in ca. 10% of patients. Should not be taken by pregnant women because the leaves have emmenagogue activity.” If you have ragweed allergies, you may react to feverfew as well. If you have these conditions, adapt your recipe accordingly. This tincture is not considered high consumption of any of these herbs, but it is good to be mindful of how they could be interacting with other conditions you may have. You certainly don’t need new problems. Lemon balm and peppermint have long traditional use in treating migraines. There is some research on the effectiveness of peppermint. Feverfew has been studied fairly extensively in migraine prevention. Taking daily capsules of dried feverfew leaves has been found to be effective in reducing migraine occurrence and severity. Göbel, H., Fresenius, J., Heinze, A., Dworschak, M., & Soyka, D. (1996). Effectiveness of Oleum menthae piperitae and paracetamol in therapy of headache of the tension type. Der Nervenarzt, 67(8), 672-681. Johnson, E. S., Kadam, N. P., Hylands, D. M., & Hylands, P. J. (1985). Efficacy of feverfew as prophylactic treatment of migraine. British medical journal (Clinical research ed. ), 291(6495), 569. Murphy, J. J., Heptinstall, S., & Mitchell, J. R. A. (1988). Randomised double-blind placebo-controlled trial of feverfew in migraine prevention. The Lancet, 332(8604), 189-192. Palevitch, D., Earon, G., & Carasso, R. (1997). Feverfew (Tanacetum parthenium) as a prophylactic treatment for migraine: a double‐blind placebo‐controlled study. Phytotherapy research, 11(7), 508-511. Vogler, B. K., Pittler, M. H., & Ernst, E. (1998). Feverfew as a preventive treatment for migraine: a systematic review. Cephalalgia, 18(10), 704-708. Pfaffenrath, V., Diener, H. C., Fischer, M., Friede, M., & Henneicke‐von Zepelin, H. H. (2002). The efficacy and safety of Tanacetum parthenium (feverfew) in migraine prophylaxis—a double‐blind, multicentre, randomized placebo‐controlled dose–response study. Cephalalgia, 22(7), 523-532. Poppy Tea (Yes, Poppy!) for Insomnia, Anxiety, and Nervousness!